This website describes the initiative of the philanthropy community in Indiana to promote the 2020 Census. It contains a comprehensive listing of 2020 Census websites from multiple federal and state sources. This entry was posted in SDC Products and tagged 2020 Census, 2020 Census Partnership and Complete Count Comm, Foundations. Sign up for news and information and the regular newsletters under the Engage tab. Check out resources page for downloadable documents to use and share with your network. Share any feedback or resources you think should be available so that we can add it to our library of resources. This entry was posted in SDC Products and tagged 2020 Census, 2020 Census Partnership and Complete Count Comm, Nonprofit. The State of Colorado is looking for volunteers to serve on the Colorado Complete Count Campaign to promote the 2020 Census. This is a website to describe and support the process. The site is maintained by the State Demography Office. This entry was posted in SDC Products and tagged 2020 Census, 2020 Census Partnership and Complete Count Comm. 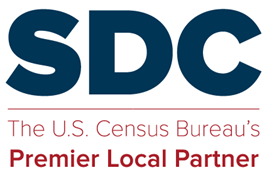 This entry was posted in SDC Products and tagged 2020 Census, 2020 Census State or SDC websites. This entry was posted in SDC Products and tagged 2020 Census, 2020 Census Info Sheets.